Red Bull is indescribable, isn’t it? The scale of the involvement in various sectors, its activities make the company almost undefinable, although it all started with a certain drink a few years ago. After multiple visits to Red Bull’s Hangar7 and Red Bull World, there is no doubt that the phrase „nothing less than perfect in everything we do” is the only way to describe the philosophy of the company. Everyone knows the product which made a certain Dietrich Mateschitz the 31st richest person in the world as of January 2019. The 74-year-old Austrian was born in Styria, Austria to a family of Croatian ancestry. His parents were both teachers. Mateschitz graduated from the Hochschule für Welthandel (which is currently the Vienna University of Economics and Business) with a marketing degree. He first worked for Unilever where he was responsible for marketing detergents. Moving to Blendax, the German cosmetics company, he took on a similar role with working on marketing toothpaste. During a business trip, he came to know the Krating Daeng, a sweetened, non-carbonated energy drink which was introduced to the Asian market in 1976. In 1982, he made a trip, working for Blendax, to Thailand and discovered the sweetened drink which helped cure his jet leg. He also found out that this drink was popular among truck drivers who consumed it to enhance their concentration level. With his Thai partner Chaleo Yoovidhya, Mateschitz founded the Red Bull GmbH and launched the Asian energy drink in a modified version as Red Bull. The Austrian then turned the drink of the Asian-Austrian cooperation into the world’s leading energy drink. Matheschitz and his business partner Chaleo Yoovidhya each held a 49 percent share and the remaining two percent went to Chaleo’s son, but it was agreed that the Austrian would run the company. While Krating Daeng is a lower cost item and is popular with blue-collar workers, Red Bull is an upscale drink. It was first introduced in Europe in Austrian ski resorts in 1987. The product later expanded to other markets, Hungary, Slovenia, then other European countries followed. It entered the US market in 1997 and the Middle East in 2000. Red Bull introduced its slogen ’Red Bull gives you wings’ in 1997. Since then, the company has played a major role in the sponsorship of various sport events. Its main attraction revolves around extreme sports, but, over the years, it expanded its presence as sponsor in other sports such as mountain bike, motocross, windsurfing, snowboarding, skateboarding, kayaking, rowing, wakeboarding, cliff-diving, parkour, surfing, skating, freestyle motocross, rallycross, Nascar racing, Formula One, DTM, football, ice-hockey, Australian Supercar Series, etc. Red Bull owns The Red Bull Salzburg and Red Bull Leipzig football clubs, the first competing in the Austrian and the latter in the German Bundesliga. The company entered the Moving Circus in 1995 as a sponsor for the Sauber F1 Team which sponsorship lasted until 2004. The energy-drink company bought Jaguar Racing at the end of that year and formed its very own Formula One team as of 2005. A year later, the company purchased the Minardi team to create its second team which was baptized Toro Rosso (the Italian translation for Red Bull). Austria’s fourth-biggest city, Salzburg is home to the Red Bull empire. The Red Bull World, a shop with a unique interior and design awaits everyone intending to buy caps, T-shirt and other products, all wearing the Red Bull logos. The store located in the main shopping street of the old city centre offers more than a casual shop does. 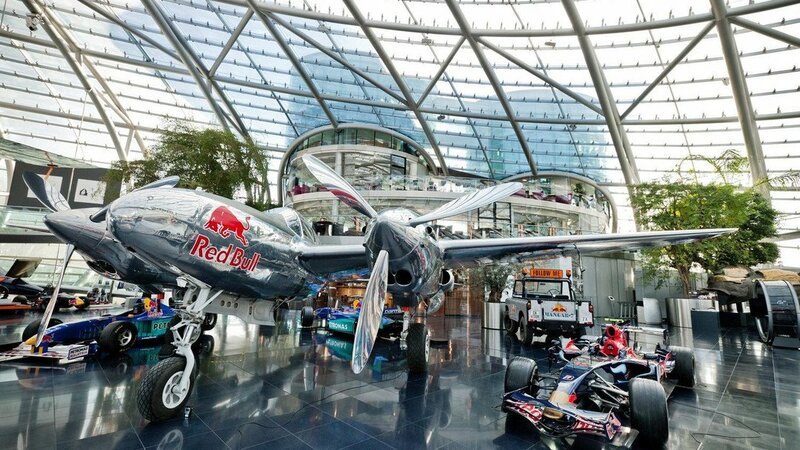 Its different corners form a Red Bull’s museum with special focus on the company’s presence and success in Formula One. Over the corner for kid’s products, Sebastian Vettel’s RB7 rests bolted onto the wall. This is the car which the quadruple world-champion won the 2011 Formula One World Championship with to clinch his second title. 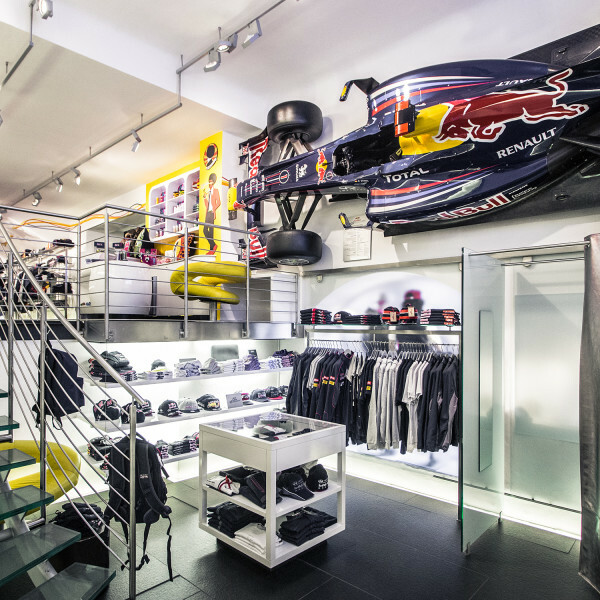 On the upper floor of the store, there is a further list of relics increasing the heart rate of motorsport enthusiasts, including a helmet of Sebastian Vettel dedicated to the Red Bull’s founder Dietrich Mateschitz and a steering wheel of the German driver. Hangar-7 at Salzburg Airport is a unique building which houses the historical Flying Bulls aircraft fleet and a collection of Formula 1 race cars. It houses the Michelin starred restaurant Ikarus, two bars and a lounge. The building is airfoil shaped, constructed of 1,200 tons of steel and 75,000 sqft of glass surface. During my first visit to the Hangar7, I was invited to a TV show. If the list of Red Bull’s activities has not been long enough, we should add that Red Bull also owns a TV station, the ServusTV. In 2004, the originally Salzburg TV was on the edge of becoming bankrupt and was sold to a company which then sold their shares to Red Bull in 2007. The energy-drink company rechristened the channel as Servus TV. The Hangar 7 Talk is one of the main programmes of the television station. That TV programme includes the Sport Talk which is recorded in the Hangar 7 and deals with actual topics from the world of sport. On the 17th of December, the Sport Talk appeared for the last time in 2018 in form of a special gala. The first part of the show was dedicated to motorsport with MotoGP star Jorge Lorenzo being the first guest. The three-time MotoGP champion was invited because he left the Ducati team at the end of the 2018 championship and is about the join the Red Bull-backed Honda MotoGP Team for the 2019 season. The TV programme then continued with the night’s two most famous guests, dr Helmuth Marko and Max Verstappen. Two days later, I headed to the Hangar7 for a second time to discover all its corners as the TV show recording took place in the middle of the luxurious building, confining some of the hot points. The building with a huge floorspace houses a list of aircrafts such as the Douglas DC-6B or the Boeing PT-17 and some masterpieces of the Sauber, Red Bull and Toro Rosso F1 squads, including the Sauber Petronas 20, the Scuderia Toro Rosso STR5, Red Bull’s RB8, RB9, RB10 and the RB13. 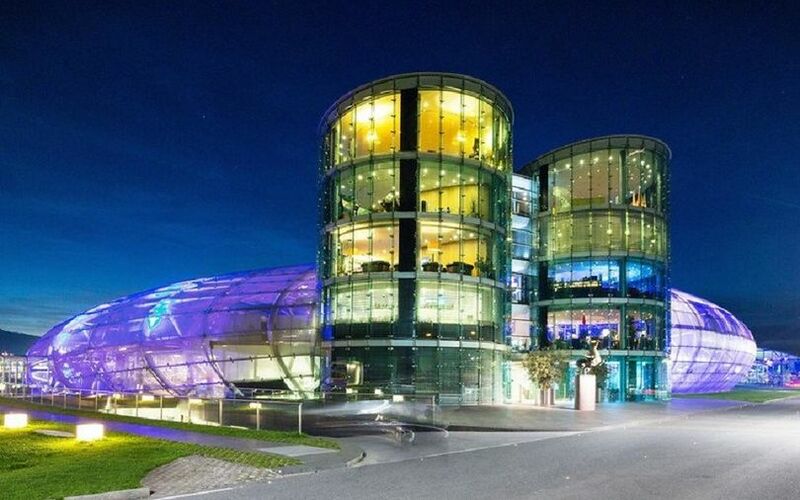 The collection makes the building to the paradise for motorsport enthusiasts. However, the building itself is also outstanding with its extraordinary architecture. Standing inside Hangar7, the transparent shell seems to open into an endless sky above the historic airplanes. In addition, Hangar7 is synonymous with modern art and superb gastronomy. Walking around inside the unique setting once again affirms that Red Bull, the company of the world’s leading energy drink is synonymous with the philosophy of striving for perfection on every area.